Cavity Enhanced Absorption, or Integrated Cavity Output Spectroscopy is a relatively new method allowing ultrasensitive detection of gas species. This technique is a spin-off of cavity ringdown technique. In cavity ringdown spectroscopy pulsed radiation from a laser is coupled to a cavity formed from high reflective mirrors (>99.9%) and the rate of decay of the pulse through the cavity is monitored. Cavity ringdown with continuous wave lasers is quite complex and expensive. Transmission of a continuous wave laser through the cavity shows the classic Fabry-Perot fringe pattern. 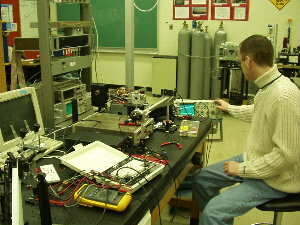 Rather than locking the cavity with the laser, the laser is ramped scanning several Fabry-Perot modes. The cavity length is jittered by a piezo-electric transducer attached to one of the mirror mounts. Several ramps are averaged thus allowing full wavelength coverage of the tuning range. The detected signal leaking through the cavity is integrated for each step of the ramp (128 steps/ramp). This allows storage of the high intensity Fabry-Perot peaks to yield a strong signal. 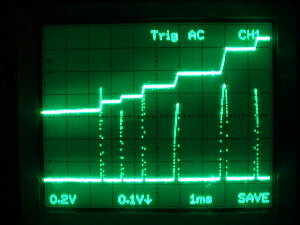 Direct absorption information is obtained from the detected signal. The high sensitivity of this technique stems from the long effective pathlength when the laser wavelength is resonant with the cavity length. Since the mirrors are highly reflective (>99.9%), the light that enters the cavity bounces back and forth within the cavity thousands of times before being transmitted through the one of the mirrors. This yields an effective pathlength of several km from a 1m cavity.